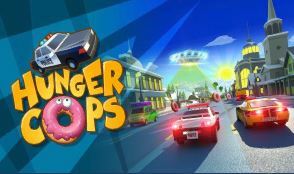 Hunger Cops is a fun arcade race game that gives you the chance to get behind the wheel of police cars and test your driving skills. Dash through car traffic, maneuver, complete quests, collect donuts and unlock more than 50 new cars! Get Police Cars from different countries around the world as well as other unique models in your collection! Get behind the wheel of a police car and show off your excellent driving skills: accelerate, swipe to avoid obstacles and collect a gazillion donuts! Go fast and furious to smash cars in your way or drive responsibly to prevent crashing: the choice is yours. Pick your car out of the abundant fleet, unlock new vehicles for donuts and ride your favorite: would it be a Bigfoot, a school bus, a bulldozer, a motorcycle or a jetpack? Or maybe even a hoverboard? Every car features unique parameters and style. Hunger Cops is also available on Itunes and Play Store. ★ Crazy road events to survive in! ★ Lots of achievements to do. ★ Test your reflexes with simple one-touch controls.